Pound 360: Shasta home to last growing glaciers in U.S. Thanks to global warming, almost every glacier in the United States is in retreat. Every glacier, that is, except for the ones on Mt. Shasta in Northern California, reports CNN. 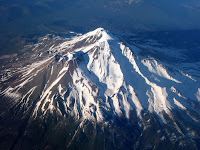 The reason: a warming Pacific Ocean has generated more precipitation at Shasta. The increased snowfall has outpaced glacier losses from a 1.8 degree rise in temps at the mountain. But Shasta is alone. The 498 glaciers and ice fields in the nearby Sierra Nevada Mountains have been slashed by 50 percent over the last century. In fact, all U.S. glaciers have been shrinking. How much longer can Shasta hold out? It's going to be difficult. The mountain needs an additional 20 percent bump in precipitation to keep up with the next 1.8 degree increase in temperatures. If the glaciers hold out for another 50 to 75 years, they'll have another, more serious, issue to worry about. Shasta is almost due for an eruption. For the past 4,000 years, Shasta has erupted once every 250 to 300. The most recent eruption was 200 years ago. laughter into your life whenever you need it. use of them. Having some company can also make the fitness session more fun. in MTV showing African American artists. "The boys said they'd been out collecting frogs when something approached from the saw grass.